There may be no backcourt in the NBA with two players whose styles contrast as much as the Clippers’ duo of Patrick Beverley and Lou Williams. One is an all-time smooth scorer, who gets buckets seemingly as easily as a flick of a light switch, with off-the-court legends so absurd he could make an airport romance novelist blush. The other is the biggest irritant in the NBA, smooth as sandpaper and tireless as a Terminator. Both Williams—the scorer—and Beverley—the menace—were instrumental (among many others) during the Clippers’ 31-point comeback against the Warriors on Monday. For now, let’s focus on Beverley, the man largely responsible for Kevin Durant leaving both Games 1 and 2 early, once due to ejection, and once due to fouling out. There are no good solutions to the Golden State Rubix cube. The Clippers have so far decided to practically concede one player on man defensive possessions, so they can better focus their efforts on the transcendent scorers. This means non-shooters and bigs—DeMarcus Cousins, Kevon Looney, Andre Iguodala, etc.—are often left to their own devices while their defender pays equal attention to the whereabouts of Durant, Stephen Curry, and Klay Thompson. It’s hard to describe the scheme as successful—the Dubs’ offensive rating through two games is 115.1, slightly higher than their regular season-leading mark of 114.9. But it does give L.A. a fighting chance, and in Game 2, it helped give Durant fits. The coverage on Durant starts with Beverley. What the guard gives up in height, he makes up for in what Russell Westbrook may describe as his blessed ability not to give a f---. Beverley is doing incredible work off the ball. He is, almost as literally as possibly allowed by NBA rules, not giving Durant an inch. Beverley is constantly in Durant’s airspace, from the second KD enters a play until the defensive possession is complete. While this is undoubtedly highly irritating for Durant, it creates problems for Golden State’s offense as a whole. Again, the Warriors are still scoring at an incredible pace, but in a tight contest like Game 2 ended up being, individual possessions become very valuable. Beverley’s insistence on not budging a millimeter not only bothers Durant, it throws off the timing of Golden State’s offense, Curry can’t simply dump a pass to KD in the post and initiate an offensive action. 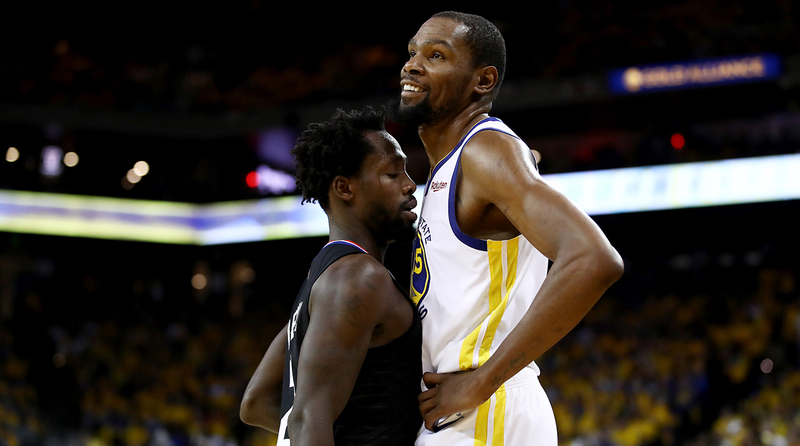 Beverley is basically engaging Durant in Greco-Roman wrestling every time KD wants to settle in a spot in the halfcourt. And the Warriors, not exactly known for their enduring attention to detail, are being taken advantage of whenever they make a lazy pass or take the ball for granted. With Durant consistently being moved off his spot, he’s either not receiving the ball, or being forced to play facilitator as soon as he makes the catch. L.A.’s roving defender also happily doubled Durant if he was in a threatening position, which contributed to KD’s nine turnovers. Beverley’s lower body strength is so impressive. KD isn’t exactly a bruiser, but he has size on his emerging nemesis. And yet, Beverley is constantly using his posterior to throw Durant off balance. Even when KD makes the catch, Beverley is disciplined enough to body him up top and move his feet to avoid the blow-by. (Though the help defense is also key here.) Bev vs. Durant is not an ideal matchup for the Clips, but whatever advantages L.A. can gain in the smallest of margins can make a big difference in a close game. Of Durant’s five field goals in Game 2, only one came against Beverley—a turnaround fadeaway off an inbounds pass which Durant launched less than a second after receiving the ball. KD otherwise struggled in the halfcourt. Of his four other makes, two came in semi-transition opportunities when the ball was being pushed up the floor, one came against Montrezl Harrell, and the other against Danilo Gallinari. When Beverley was locked in, Durant was often being shoved around, or hounded to the point where he was best served moving the ball to someone else. This all says nothing of the mental toll it must take on Durant to face a defender like Beverley. KD can’t take a possession off, and this is a Warriors team that is still probably mentally cruising until the next round. Beverley is also clearly a pest, and Durant’s frustrations combined with his desperation to shake free of his personal pest led to a couple offensive fouls and bad passes. Those mistakes obviously add up, and it’s possible Golden State is still a winner if Durant simply hadn’t fouled out with just over 80 seconds left in the game. 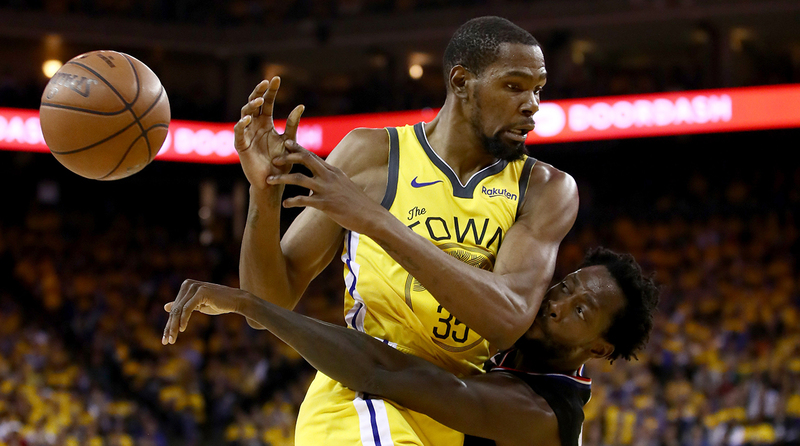 Beverley’s enduring annoyance simply won out Monday, and Durant’s effort was mitigated just enough to give the Clippers a chance to steal a win as all the other Warriors’ systems collapsed as well. The biggest mistake anyone could make is overreacting to Game 2. The Warriors aren’t invulnerable, but betting on them to lose this series would be foolish. Beverley’s defense has been fascinating to watch over two games, and even still Golden State’s offense is still humming at an explosive rate, and it took several factors for the Clippers to eke out a four-point win. But Beverley’s relentless defense at the very least deserves to be appreciated. It may be rough to watch in the moment, but that’s exactly what he’s going for.